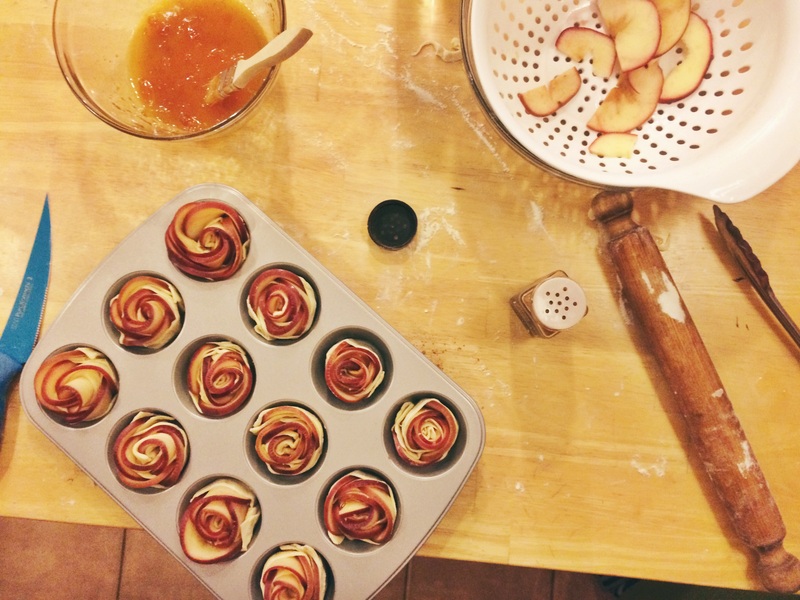 So, while I’m sitting here waiting for my apple roses to cool down, so I can shove 2 in my mouth at the same time, I figured this would be a really wonderful fabulous un-excusable time to write a post about them ! Yes, that was a massive run on. Anyway, this was for sure a fun experience ! I decided that I would purchase puff pastry for this baking festivity, and have only played around with store bought frozen puff pastry once before… I normally just make it myself even though it’s a timely process. So before I post the recipe, I wanted to mention that this can seriously be made anyway you want. You can adjust the amount of apples & kind, preserve filling/coating, amount of apple slices per flower and even the apple softening method(refer to recipe). 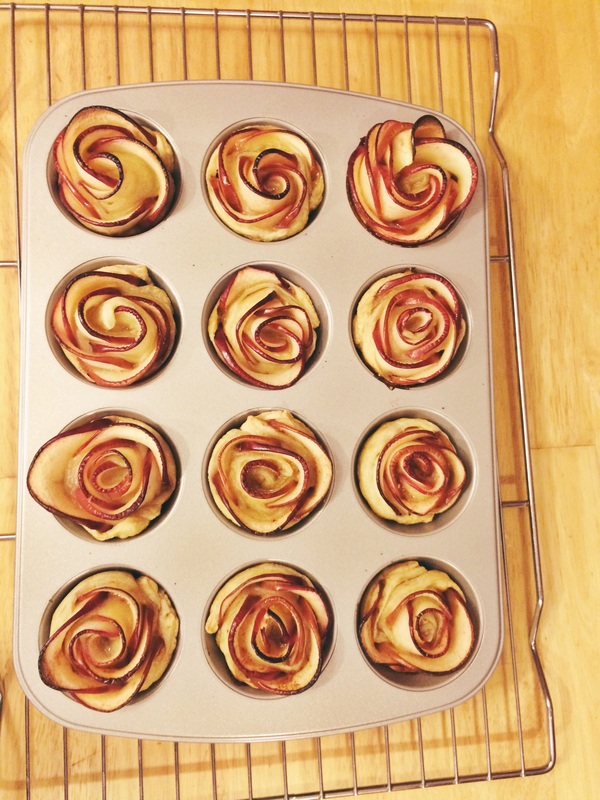 Simple, quick(kinda), easy and beautiful apple roses ! Apples are sliced thin, then gracefully placed, sprinkled with cinnamon and rolled gently into a strip of puff pastry; baked for 40 minutes. Serve as a dessert with a scoop of vanilla ice cream or however you want! Start by slicing apples into thin pieces, almost transparent, but not completely. Use a mandolin if needed. Grab a medium sized microwave safe bowl and fill it half way with water. Squeeze the juice from one lemon and mix with the water. Add apple slices to the same bowl and microwave for about 4-5 minutes. You’re looking for the slices to be bendable, if they’re not, add another minute in the microwave (if you don’t want to use a microwave you can just bring a pot of water to a bowl with the lemon juice and soften the apples this way as well) Drain the water from the apples and set aside. Add apricot preserve to a small bowl with the 4 Tbsp of water and microwave for 1 minute. Unroll and lay out the thawed puff pastry on a floured surface. Using a rolling pin, carefully stretch out the pastry by giving it several rolls. Careful not to make the pastry too thin. Then, cut out six even strips of pastry from each sheet. Take each pastry strip and brush on some of the apricot. Line the apples horizontally down on each strip so the skin side faces off and hangs off the pastry. You also want to overlap the apple slices when placing them. 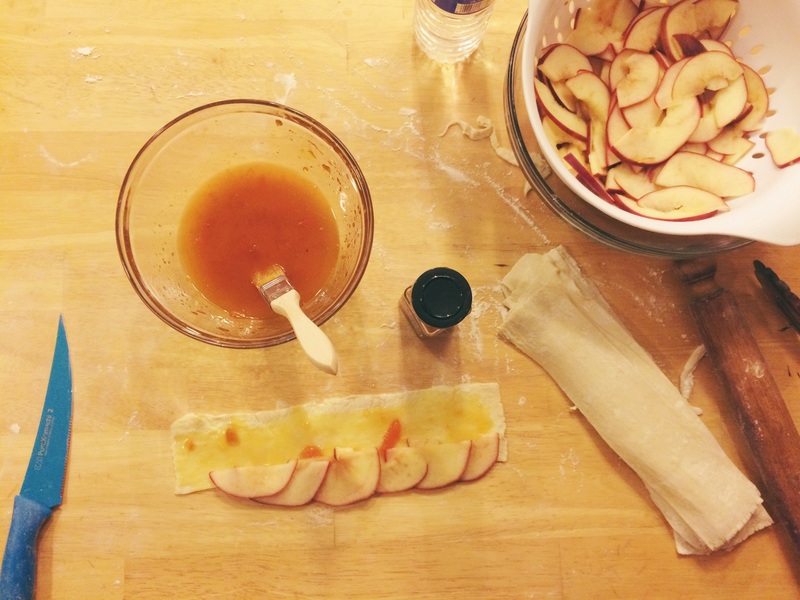 Then, fold the bottom of pastry over the apple slices vertically like you’re tucking them into bed. Finally, carefully roll the puff pastry end to end to create your rose. 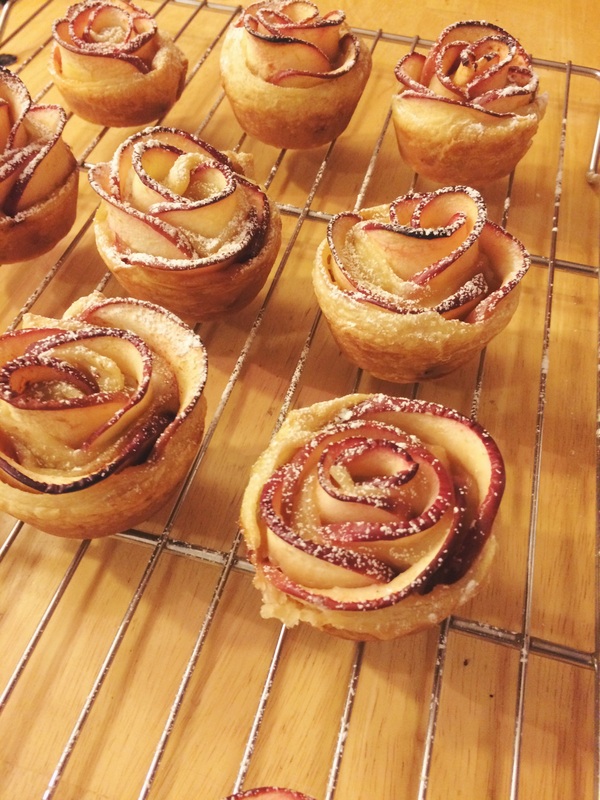 Place each finished rose into a cup cake pan and then bake for 40 minutes. Let cool on a rack in the pan, dust with powered sugar(optional) AND ENJOY! Prepare your own puff pastry if you have time vs store bought. [br]Save some of the apricot preserve to add as a glaze on top instead of using powered sugar. 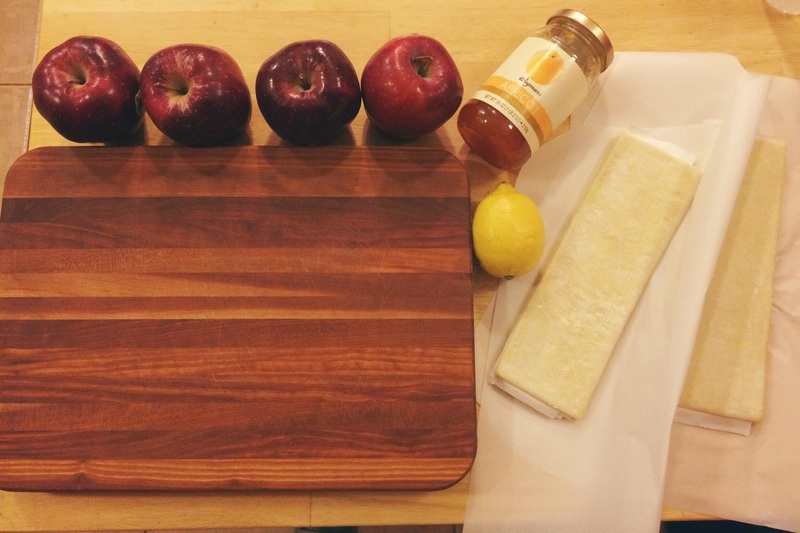 [br]Switch out the preserves to another flavor or switch up the fruit to pears. [br]Or go crazy and change the fruit to a vegetable like a potato and maybe roll in some spinach and a spread of béchamel sauce? (this actually sounds pretty darn good right now)ITS ALL UP TO YOU!